We’re happy to introduce the Collection Catalog, a new section on our website listing the historical record collections indexed and available on MyHeritage SuperSearch™. The catalog is useful for beginners as well as professional users. It lists next to the name of each collection the number of records in it and the date in which it was added or last updated, and indicates with a special icon which collections are new or recently updated. Some people call this a “card catalog” in reference to the way libraries used to index their inventory on cards in the old days, but our Collection Catalog is digital; It is available online and includes many useful functions. The Collection Catalog feature has been on our to-do list for several years. We increased its priority because it has been requested by many of our users, including prominent genealogist Judy Russell who authors the blog The Legal Genealogist. It is another example of the importance we place on listening to our community and responding to user requests. The Collection Catalog is accessible from the Research tab in the main navigation menu. 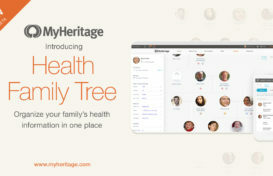 It can also be accessed from the SuperSearch homepage, and from the footer of the of the MyHeritage website under the Research section. The Collection Catalog lists the collections currently available in SuperSearch. The top of the page may list a few Featured Collections, which are collections we wanted to bring to your attention because of their special value. Featured collections often include content that cannot be found anywhere outside of MyHeritage, and we’ll designate new collections as Featured periodically. Some collections are denoted with “New” or “Updated” indications. The collections can be sorted by the number of records they contain, the date they were last updated, or by collection name. You can browse the collections available; move the mouse over the title of any collection to see a concise description of the collection. In the left panel, you can refine the collections by category, location and by date (year ranges). You can also choose to only display record collections with original images. You’ll see all main categories and the number collections in each category. Click a category, to view only collections from that category. We’ll list sub-categories if there are any, and the number of collections for each. Use the search option to search the catalog by keywords. Enter search term(s) into the main search field at the top right, then click the magnifying glass. The search for “church” in the following example returns 467 collections that contain this term in the collection title or description. To clear a search, click “Clear search” on the top left of your search results. Once you’ve found a collection of interest, click its name. You will be taken to the main search form of the collection, where you can begin searching for historical records inside it. You’ll notice that the Collection Catalog displays the exact record count of every collection. At the moment, SuperSearch includes 7.757 billion records. We’ve been displaying record counts in SuperSearch for years. We believe it is important for transparency. We’ve noticed that many other services don’t provide record counts. Also for sake of transparency, we would like to repeat the description of how we count records, which we published back in April 2014 when we celebrated reaching the 5 billion record milestone. In structured collections, such as census records, birth, and marriage records, each individual name is counted as one record. For example, a marriage document naming both the bride and groom is counted as two records. Nicknames or aliases are not counted as additional records. In family trees, each tree profile is counted as one record, even when it is available in more than one language. Each photo is counted as one record. In unstructured collections, such as newspapers or yearbooks, each page is counted as one record even though it may include hundreds of names. We count each page as a single record because we don’t want to inflate the record count by guessing. 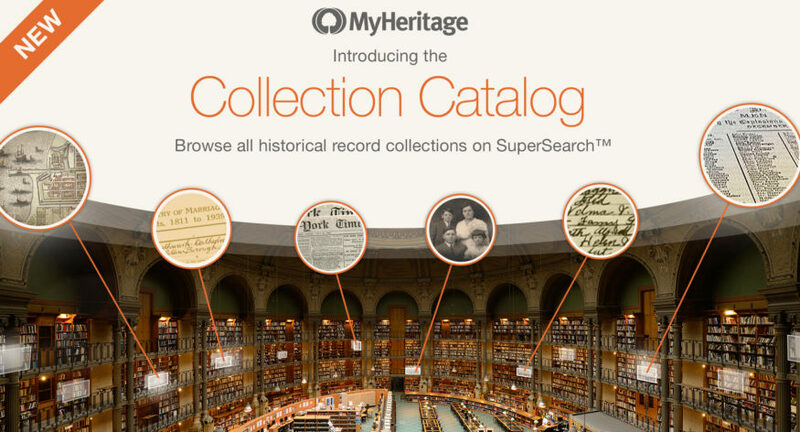 The new Collection Catalog provides a useful listing of the collections on SuperSearch and is a gateway to the vast historical treasure trove of 7.8 billion records currently offered by MyHeritage. The catalog lists our 6,503 main collections and excludes tiny collections that have fewer than 500 records each. We may add these to the Collection Catalog at a later date. 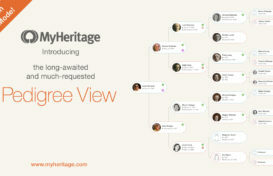 We’re working continuously to add more records to help you learn more about your ancestors and uncover your past. We expect to add several new collections with more than 300 million records collectively within the next 2 months. At that point we will reach the milestone of 8 billion historical records. You are welcome to visit the Collection Catalog (and our blog :)) regularly to see which new collections we’ve added or updated. We hope you’ll find the new Collection Catalog useful for your family history research. Can’t wait to use and show this in some of my genealogy classes I teach. I love My Heritage and believe everyone should use it. Wow! That is awesome news! Thanks! I’d like to see something that would allow test takers the abilities to ask questions about their DNA results. For instance, an Ashkenazie Iberian project admin has concluded that my paternal grandmother has Sephardic lineage and my brother showed 3% Sephardim and I show everything but; my dad’s first cousin showed none of the Sephardim and she was out of the maternal line. My mother and I show a very small amount of Ashkenazie at 23andMe (I show 1.7 at DNA.Land), however, at My Heritage I show this Middle Eastern and some other things. I don’t know how to interpret this information against all the other pieces of information. It really can get to be very confusing. A great contribution to genealogists who are source oriented, as to opposed to name gatherers. One of the great need for years has been knowing what sources are available and how to access them. Next, we need a super platform that shows access points for sources by specific jurisdiction (Parish or town, County, Country.